Mark your calendars. College football fans, kickoff times are here. Hey, Texas, the college football TV schedules are out. We've got your teams mapped no matter what color you wear. The college football TV schedules have been released. Luckily for all you football-crazed Texans out there, we've mapped when and where your favorite teams will be on the big screen, no matter what colors you bleed. Texas will have two non-conference games televised. First, in their home opener against Tulsa, the Longhorns will grace the television screen at 7 p.m. Sept. 8 on the Longhorn Network. And then the following weekend, Texas will play against the USC Trojans at 7 p.m. Sept. 15 on FOX. The Aggies will play a set of three non-conference games on television. The season opener on Aug. 30 against Northwestern State will be aired at 7:30 p.m. on the SEC Network. 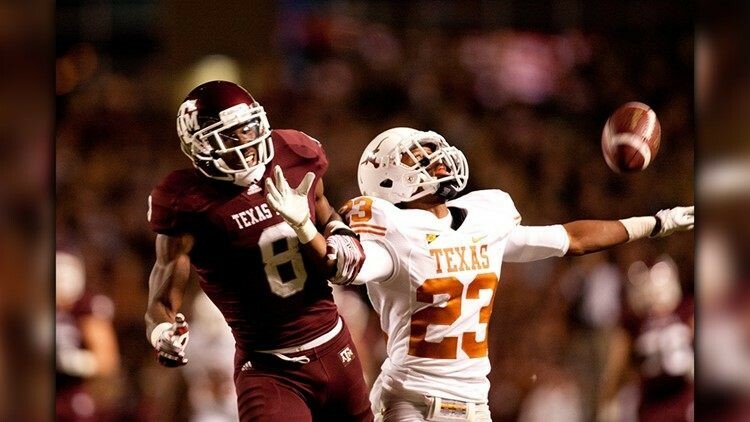 In a primetime matchup, Texas A&M squares off with the defending ACC Champions, Clemson, at 6 p.m. Sept. 8 on ESPN. Rounding out the non-conference slate, the Aggies take on Louisiana-Monroe at 6:30 p.m. Sept. 15 on the SEC Network. Baylor will open the 2018 season at McLane Stadium against Abilene Christian AT 7 p.m. Sept. 1. on FSN. Two weeks later, the Bears host ACC member Duke at 2:30 p.m. Sept. 15 on FS1. Finally, Baylor will travel to face West Virginia in a Big 12 Conference matchup at 6 p.m. Oct. 25 on FS1. Mark your 📆 and set your ⌚️. The Cougars have a slew of televised games in 2018. The season opener against the Rice Owls will be shown on the CBS Sports Network at 11 a.m. Sept. 1. Houston will host Pac-12 member Arizona at 11 a.m. Sept. 8 on ABC. One week after that, the Cougars head to Lubbock to square off with the Texas Tech Red Raiders at 3 p.m. Sept. 15 on FOX. The Cougars then return home for a two-game stint: first against Texas Southern at 7 p.m. Sept. 22 on ESPN3, and then versus Tulsa at 7 p.m. Oct. 4 on ESPN. The Cougars return to CBS Sports Network at 2:30 p.m. Oct 20 against the Navy Midshipmen. And finally, Houston hosts Tulane at 7 p.m. Nov. 15 on ESPN. 🏈 | The #HTownTakeover 2018 SCHEDULE is officially out! The Red Raiders have a slate of four televised games in the 2018 season. In the season opener, Texas Tech plays a neutral site game against Ole Miss in Houston, which will be shown at 11 a.m. Sept. 1 on ESPN. The following week, Texas Tech hosts Lamar at 3 p.m. Sept. 8 on FSN. In week 3, the Red Raiders host the Houston Cougars at 3 p.m. Sept. 15 on FOX. In the Red Raiders' third conference game of the 2018 season, they travel to Fort Worth to battle with the TCU Horned Frogs at 6:30 p.m. Oct. 11 on ESPN. The SMU Mustangs host TCU in its first televised game of the 2018 season. The game is scheduled to kickoff at 7 p.m. Sept. 7 on ESPN2. In week three, SMU travels to Ann Arbor, Michigan to show the Wolverines what they have in the Big House. The Mustangs and Wolverines battle it out at 2:30 p.m. Sept. 15. on the Big Ten Network. In the final home game of the season, SMU will take on fellow AAC member Memphis at 8 p.m. Nov. 16 on ESPN2. Rice will have one game televised in the 2018 season: a week two matchup with the Houston at home. The Owls take on the Cougars at 11 a.m. Sept. 1 on the CBS Sports Network. The Texas State Bobcats return from a 2-10 2017 season with four televised games on its 2018 schedule. Texas State will open the 2018 season on the road against Rutgers at 11 a.m. Sept. 1 on the Big Ten Network. In the Bobcats' home opener, they will face Texas Southern at 6 p.m. Sept 8 on ESPN3. In the following week, Texas State hits the road again in a matchup with South Alabama, which can be seen on ESPN+ at 6 p.m. on Sept. 15. Lastly, Texas State will be seen on television on Oct. 11 when the Bobcats face the Georgia Southern Eagles at 6:30 p.m. on ESPNU. The UTSA Roadrunners first two road games will be televised by FOX Sports. UTSA opens its season on the road against Arizona State at 9:30 p.m. Sept. 1 on FS1. Two weeks later, the Roadrunners will travel to Bill Snyder Family Football Stadium to face Kansas State at 3 p.m. Sept. 15 on FOX Sports. The first two UTSA road games will be televised by @FOXSports. If you can't make the trips to Tempe or Manhattan, you can still watch the Roadrunners on TV. TCU will open its 2018 season with three straight televised games: the home opener against Southern University at 11 a.m. Sept. 1 on FOX, on the road versus SMU at 7 p.m. Sept. 7 on ESPN2, and in a primetime home matchup against Ohio State at 7 p.m. Sept. 15 on ABC. The fourth and final televised game scheduled for the Horned Frogs is their mid-season home game against Texas Tech, which will be aired at 6:30 p.m. Oct. 11 on ESPN.